Who doesn't like free stuff? I'm quite the penny pincher myself that's why I always make it a point to seize every money-saving opportunity that comes my way. The more convenient, the better and no other rewards system card that I've come across has been easier and most affordable to use than the Zap Tag. 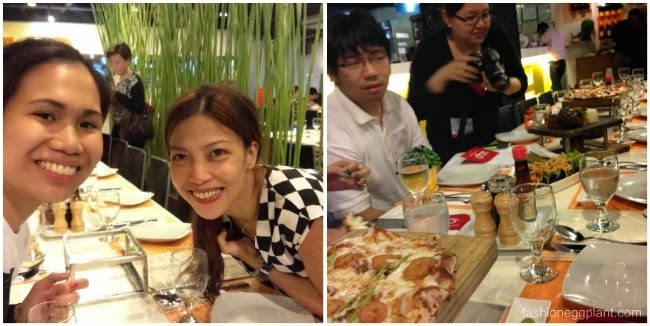 During an event entitled the Zap Crawl: Greenhills, myself and a few other select bloggers were able to experience the benefits of having our very own zap card. We started off our evening with wine tasting at Zap partner establishment, Wine Depot along Missouri street in Greenhills"
We were then fetched by our very professional and posh chaffeur service for the night provided by UBER to take us to our next destination, another Zap affiliate and long time favorite of mine and The Clingies, Torch Resto! Torch resto serves really good comfort fusion food. Some must-trys are their pizza, salpicao medallions and lava cake. (You can check out my review HERE). Torch also offers 5% cashback! After a huge dinner which me and Ana managed to divulge entirely in a matter of minutes (because we were so hungry from our full-day garage sale earlier), it was time to be picked up once again by UBER to take us to our next destination: Coffee/Dessert + movie at Promenade, Greenhills. When we got to Promenade we could choose to have our dessert either in Happy Lemon, Red Mango, Yoh Froz, Figaro or Sugarhouse (all zap affiliates with cash back), I can never resist a good cup of Coco Rock Salt from Happy Lemon (especially when it's free! :P) so I chose to have mine there. By the way, it was free because I used my accumulated Zap points to pay for it. 1 Zap point = 1 peso, not bad right? Plus it was a breeze using it as well, the staff was well-trained and our transaction was very smooth. No need to call the manager or ask help from a supervisor! Even better? I immediately received a notification text within 5 seconds plus, I still got a 5% cashback even if I used my exciting points to pay. All in all, I was only charged 95 points instead of 100! 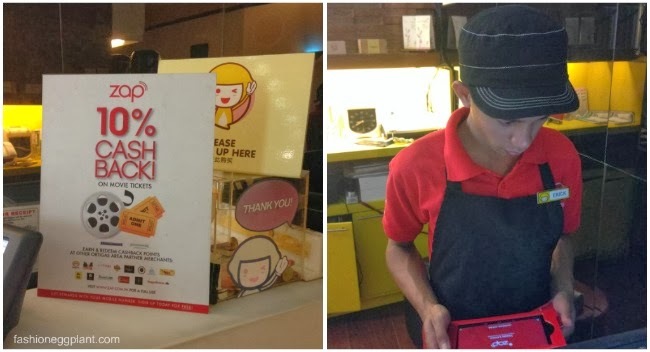 Even if I was dead tired from a weekend of waking up early and selling stuff all day, I still ended the night happy with my free cup of Happy Lemon and lots of Cashback points from Zap to spend in other partner establishments (just look for the zap sticker at the door)! Since getting your own Zap is TOTALLY FREE, I highly recommend spending a minute or two to sign up. It's super convenient because even if you don't have your card with you, you can still earn points by simply giving the server the mobile number you registered with. It's a win-win situation with LOTS of freebies in store for you! ***about UBER - download the app for free, book your ride and a posh and ultra-safe unmarked vehicle will come get you! Perfect for formal events, business meetings and days when you're super tired. Check it out and use the COUPON CODE: UBERLOVESFASHIONEGGPLANT to get P500 worth of FREE CREDITS!